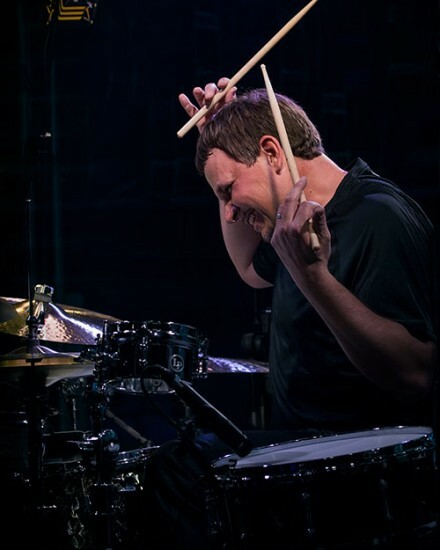 Keith Carlock is a professional drummer currently residing in New York City, NY and Nashville, TN. He has recorded and/or toured with such musical luminaries as John Mayer, Sting, Steely Dan, James Taylor, TOTO, Christopher Cross, Donald Fagen, Walter Becker, Diana Ross, Faith Hill, The Blues Brothers Band, Mike Stern, Leni Stern, David Johansen and the Harry Smiths, Richard Bona, Chris Botti, Wayne Krantz, Rudder, Harry Belafonte, Oz Noy, Larry Carlton, Clay Aiken, Rascal Flatts, Paula Abdul and Grover Washington, Jr, to name a few. Keith was recently voted number 1 Pop drummer, number 1 Fusion drummer, and number 1 Best All-Around drummer in Modern Drummer’s 2009 Readers Poll and would like to thank all that voted! Keith’s first ever instructional DVD is now out with Hudson Music! It’s entitled “Keith Carlock- The Big Picture: Phrasing, Iimprovisation, Style, & Technique, and you should get your copy now!!! Within one bar of the groove, I can tell it’s Keith. There’s nobody out there who sounds like him. When Keith plays he’s not mathematical. He’s very spiritual. He’s as advanced technically as anyone I’ve ever played with, but his technique always serves the music. Keith worked with me on the Sacred Love tour. It’s a big chair to fill in my band; some of the greatest drummers in the world have sat there: Stewart Copeland, Omar Hakim, Manu Katché, Vinnie Colaiuta. Keith took his place as if born to the job. An impeccable creative musician, powerful as well as sensitive, patient and understanding in the face of my often inarticulate and conflicting demands. Anyone who has passed through my band remains family, brother Keith is no exception. Keith’s attitude, his enthusiasm, and everything is just great. When you’re cutting tracks like we do, the band will get to a certain point when things are working and everything coalesces, and everybody realizes they are now going to play a take. To get there you need not just the drummer, but everybody to have refined their parts. We had that with this band, thanks in large part to Keith. We would get to that point and converge on something, and he would give us a take we could really work with. …we’re trying to re-create a kind of rhythmic feel that predates the drum machine era, where it’s really a feel generated by the players, something that has a swing and a lope to it and still has hypnotically steady time. With Keith, everything he tried to play worked in that way. He also began with a good idea of where a tune was supposed to go, and he got better as we played it. He actually made this whole thing possible… His groove is just as good at the end of the day as it is at the beginning.